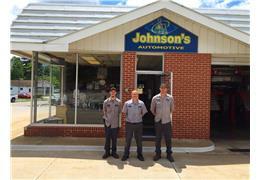 Welcome friends, At Johnson Service we strive for top notch customer service. We are your dealer alternative repair center. We perform all types of repairs, We prefer customers who entrust us with their investment from the time you buy until the time you decide to sell. We pay very particular attention to detail. Car's are a very big investment of your hard earned money and we understand that. We like to thoroughly look your vehicle over every time it comes to the shop for service. We will keep track of and maintain your vehicle per the recommendations of the manfacture's service intervals.